Kamala Harris continues to advocate for a bill she introduced back in January of this year. Right now almost half of Americas don’t have enough cash to cover a $400 emergency expense. That’s just frightening. It’s why I introduced the LIFT Act to give middle class families a tax credit of up to $500 a month. 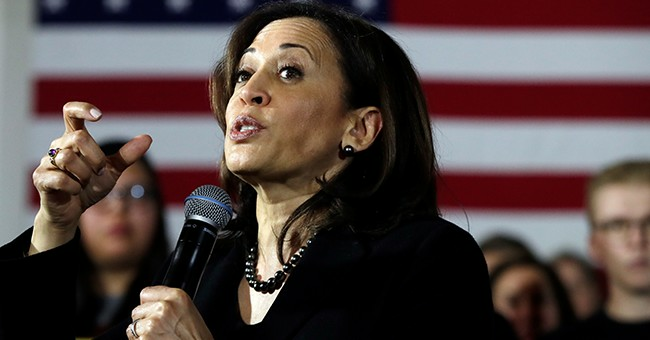 Under Harris’s bill, families earning less than $100,000 annually will obtain up to $6,000 per year through refundable tax credit. Families can access $500 of that credit per month or collect the full amount by the end of the year. Single filers have access to $3,000 per year if they earn less than $50,000 annually, and can collect $250 per month. The LIFT Act garnered support from mayors across the state of California, the Ontario Chamber of Commerce and the Washington State Budget & Policy Center. But the bill could prove to be a blunder that will burden the middle class. The Tax Foundation found that in order to fund the LIFT Act, it would cost the federal government $2.7 trillion by 2028. It would also take away nearly 900,000 jobs from the public. Despite these issues, the foundation says the plan would provide a large increase in income for low-class taxpayers. But it may not prove to be a bonified success. The Washington Free Beacon brought up an experiment that involved six states between 1968 and 1980. By the end of the experiment, “desired hours of work” decreased by 43 percent on average for single men who weren’t heads of households, 25 percent for single women who were heads of families and 20 percent for wives. "Policy should be designed to reward work, rather than replace it," Menon said.